An ultra-thin, flexible device has been developed by researchers to detect a person’s blood glucose levels. The device eliminates the need for the finger pricks often used by diabetics, and it works like a temporary, rub-on tattoo. Part of living with diabetes is the monitoring of blood glucose levels. It is an important part of managing the disease and something that hundreds of millions of people do worldwide. Traditionally, measuring blood glucose meant pricking a finger to get blood for the test, which can be painful. In some cases, the process could even discourage people from properly tracking their disease. An alternative approach to the painful finger prick was the goal of researchers from the University of California in San Diego (UCSD), according to a recent press release from the American Chemical Society. The new device is a non-irritating, wearable technology that detects blood glucose levels just underneath the skin. The device was tested as a proof-of-concept on seven patients, and results were compared to traditional blood glucose measurements. 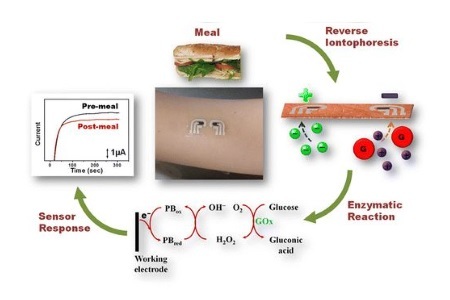 The new sensor is worn like a temporary tattoo, according to a recent study published by the team in Analytical Chemistry. The device depends on the reverse iontophoretic extraction of interstitial glucose through the epidermis that it resides on. After extracting the sample, the device tests it using an enzyme-based amperometric biosensor included in its design. In vitro analysis showed a linear response by the sensor when exposed to varying levels of blood glucose. Additionally, the sensor was relatively unaffected by other common electroactive species, which is important to prevent a false reading. Testing was conducted by placing the sensor on diabetic patient and monitoring blood glucose changes that occurred after a meal, according to the study. To validate the sensor’s specificity, controls were used on each patient’s body, which showed that the sensors were capable of producing the desired specificity. Showing the effectiveness of reverse iontophoresis for this application was exciting for the researchers, because they believe the technology can be extended to other areas, like kidney disease. Developing alternatives to the invasive pin prick that diabetics must endure is a research focus that occupies many groups. Recently, another solution was presented that uses a laser to non-invasively measure blood glucose, also serving to eliminate the need for a finger prick.